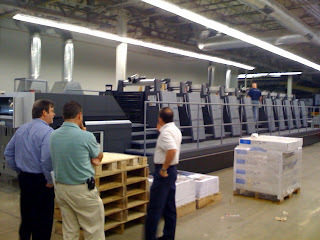 Here is a shot of the massive 10 color Heidelberg press brand new at DS Graphics in Lowell. We are some of the first ones to use it - and for my latest job, an internal communications magazine, News & Views (see next post for cover). The cool thing about it, is that for a normal 4 color or 5 color job, you don't have to do a work-and-turn. You can print a 5 color sheet and then it can flip it "in-press", midway through, and then print the other 5 color side! The guy standing in blue in the middle of it, is where that happens. It's got glass you stand on right there so you can see it happen, pretty cool. And all the other technology and installation and perfection that goes into it, is just mind boggling, not to mention the multi-million dollar price tag. You could also do some ridiculous 8 color job with 2 varnishes or something if you wanted to. Or maybe a hexichrome, plus PMS's, plus varnishes, ah, the possibilities. Anyway, my job came out great, a few changes by my boss, Paul and I (he's on the left there), and it should be bound and done by Thursday, just in time to put on the fridge for July 4th weekend. And for my brother Patrick's 24th birthday. Happy Birthday big guy!